Many people who visit the battlefields of Gettysburg, PA, come to see the monuments, to feel the history that this place emanates and to gain understanding on the ramifications of the term “The turning point of the Civil War.” A huge tourist draw is the Cyclorama at the visitor’s center. What people don’t seem to realize is the Cyclorama depicts the exact moment that the war turned sour for the Confederacy. General Robert E. Lee decided to put an end to the battle in one large charge. Even though Lee’s Lt Gen James Longstreet predicted this was a futile offensive, the General nevertheless ordered Maj. Gen George Pickett to charge Cemetery Ridge. The attack failed and has been forever dubbed the high water mark of the Confederacy. The Gettysburg Cyclorama: The Turning Point of the Civil War on Canvas is an excellently crafted book. Authors Chris Brenneman and Susan Boardman dive deep into the history of the panoramic exhibit, painted by Paul Dominique Philippoteaux. You learn everything from the first showings, to the first public exhibition in Gettysburg commemorating the 50th anniversary of the battle, to its current home in the recently constructed visitor center. The authors also provide an extensive recounting of the charge itself and how that one day in southern Pennsylvania changed a nation forever. For me the star of the show is the tremendous work of award winning photographer Bill Dowling. As a licensed battlefield guide, he understands the significance of the hallowed fields of Gettysburg, and every photo exudes the reverence and careful attention to detail that the painting’s depiction so richly deserves. For history buffs, The Gettysburg Cyclorama: The Turning Point of the Civil War is a must-have for their collection, but I would encourage every American to pick up a copy and learn the story of how this nation really achieved freedom from domestic oppression in the bloodiest land war this nation has ever witnessed. Thanks Paul for this wonderful review. We spent a lot of time trying to make this book as thorough and comprehensive as possible. It is really great to hear from others who like what we have put together. 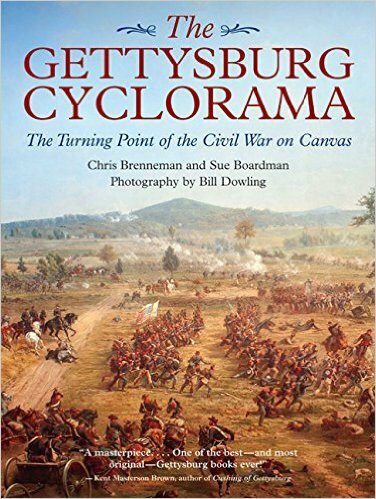 Hi Paul, As I said in my reply to Ted Savas’s recent comment, I appreciate that you took the time to read the cyclorama book and give it a favorable review. If you haven’t seen the painting in person yet, let me offer an invitation! It is as beautiful as it looks in Bill Dowling’s photos!! Thank you Susan, I have had the honor of viewing the painting both at the newer Visitor Center and the previous location. It is truly a work of art.